Other than those of ASTRO's, satellite dishes are prohibited by law in Malaysia. Many quarters have tried in the past, to get the government - including those that were initiated by NGOs and some leaders from ruling government - to lift the ban on the use of such dishes in order to receive transmissions of information from foreign countries. 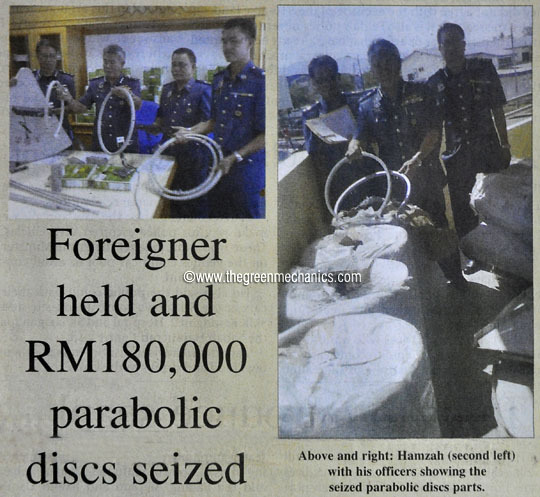 Latest on the Customs Department's crackdown on banned goods saw its officers confiscating 106 sets of parabolic satellite dishes worth RM180,000 and is the biggest such seizures in Sabah so far. According to current market price, the seized sets of dishes could worth RM265,000. State Customs Deputy Director (Enforcement and Compliance), Hamzah Sundang told a media conference in Keningau Friday that the 2.20pm raid at a house in Jalan Masak here was made by a team lead by the District Customs Enforcement Officer, Michael Asik. He said the parabolic dish is a prohibited item listed under Schedule II of Custom Rule (Prohibition on Import) 2008 and would require an import permit from Sirim Berhad. Those found in possession of a parabolic dish without valid permit could be charged under Section 135 (1)(d) of the Custom Act 1967, which provides a fine of not less than 10 times the value of the seized goods for the first offence and not more than 20 times the value of the goods or a jail term of not more than 3 years or both, if convicted. Schedule II (Prohibition on Import) 2008 : Goods can be imported only with an Import License. Example: telephone sets, telephone sets for cellular network, base station, switching & routing apparatus, telephonic & telegraphic apparatus, walkie talkie, transceivers, radio telephonic receivers. Looking at the Schedule II of the (Prohibition of Imports) Order 2008, the reason for the prohibition can be speculated as not having the import permit necessary to bring in the apparatus, and possible quality control issues. Nothing else. I read the short presentation on THE CUSTOMS IMPORT PROHIBITION ORDER 2008:- THE ROLE & FUNCTION OF CUSTOMS by Sirim-QAS and found no specific reason for the prohibition other than possible interference in the local communication system by such telecommunication apparatus. If you can get SIRIM to check on the quality of these dishes, you should be permitted to get them imported. The number of dishes and money involved in the latest crackdown gives us an impression that there could be more shipments of this popular household item that went undetected. The monopolistic nature of ASTRO business model, coupled with the recent revision of fees/charges and the implementation of the 6% government service tax put ASTRO out of many people's reach and hence, the difficulty in accessing information, especially to the rural folks. If people are hindered from their right to information, due to financial or legal reasons, they will find ways through the back door, as demonstrated by what is currently happening. The key is 'Import Permit'. Under certain conditions, the law permits you and me to bring in such dishes. So, why don't we relax the conditions a little bit and allow the people access to information. After all, the Malaysian government has never put any restriction to internet access in the country. **UPDATE** - Another 90 satellite dishes worth RM225,000 were seized by Sabah Customs in Keningau on Monday. This makes a total of 196 confiscated parabola set. Total market worth is now RM490,000. (Source: Daily Express, 19-06-2012, page 4).